ONGC on Last friday closed below its 200 DMA which stands at 1114.A stock which closes below its 200 DMA comes under Bear’s attack on every pull back. We need to watch for how many days ONGC closes below its 200 DMA,as if it recovers in coming 2-3 sessions than we can consider this as a wip saw and ignore it. 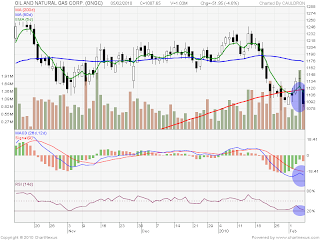 As Nifty looks ripe for a bounce if global sentiments are suppostive.